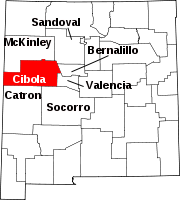 Cibola County is a county in the U.S. state of New Mexico. As of the 2010 census, the population was 27,213. Its county seat is Grants. It is New Mexico's youngest county, and the third youngest county in the United States, created on June 19, 1981, from the westernmost four-fifths of the formerly much larger Valencia County. Cibola County comprises the Grants, NM Micropolitan Statistical Area, which is also part of the Albuquerque-Santa Fe-Las Vegas, NM Combined Statistical Area. According to the U.S. Census Bureau, the county has an area of 4,542 square miles (11,760 km2), of which 4,539 square miles (11,760 km2) is land and 2.3 square miles (6.0 km2) (0.05%) is water. As of the 2000 census, there were 25,595 people, 8,327 households, and 6,278 families residing in the county. The population density was 6 people per square mile (2/km²). There were 10,328 housing units at an average density of 2 per square mile (1/km²). The racial makeup of the county was 39.61% White, 0.96% Black or African American, 40.32% Native American, 0.38% Asian, 0.05% Pacific Islander, 15.44% from other races, and 3.24% from two or more races. 33.42% of the population were Hispanic or Latino of any race. There were 8,327 households out of which 38.00% had children under the age of 18 living with them, 50.60% were married couples living together, 18.30% had a female householder with no husband present, and 24.60% were non-families. 21.10% of all households were made up of individuals and 7.30% had someone living alone who was 65 years of age or older. The average household size was 2.95 and the average family size was 3.41. In the county, the population was spread out with 30.70% under the age of 18, 9.60% from 18 to 24, 27.50% from 25 to 44, 21.50% from 45 to 64, and 10.70% who were 65 years of age or older. The median age was 33 years. For every 100 females there were 95.50 males. For every 100 females age 18 and over, there were 92.20 males. The median income for a household in the county was $27,774, and the median income for a family was $30,714. Males had a median income of $27,652 versus $20,078 for females. The per capita income for the county was $11,731. About 21.50% of families and 24.80% of the population were below the poverty line, including 32.00% of those under age 18 and 17.70% of those age 65 or over. As of the 2010 census, there were 27,213 people, 8,860 households, and 6,274 families residing in the county. The population density was 6.0 inhabitants per square mile (2.3/km2). There were 11,101 housing units at an average density of 2.4 per square mile (0.93/km2). The racial makeup of the county was 41.8% white, 41.0% American Indian, 1.0% black or African American, 0.5% Asian, 0.1% Pacific islander, 12.4% from other races, and 3.1% from two or more races. Those of Hispanic or Latino origin made up 36.5% of the population. In terms of ancestry, 5.4% were Irish, and 1.5% were American. Of the 8,860 households, 38.0% had children under the age of 18 living with them, 41.1% were married couples living together, 20.8% had a female householder with no husband present, 29.2% were non-families, and 24.9% of all households were made up of individuals. The average household size was 2.79 and the average family size was 3.30. The median age was 36.6 years. The median income for a household in the county was $37,361 and the median income for a family was $41,187. Males had a median income of $36,027 versus $25,318 for females. The per capita income for the county was $14,712. About 20.1% of families and 24.0% of the population were below the poverty line, including 32.7% of those under age 18 and 14.3% of those age 65 or over. All public schools in the county are operated by Grants/Cibola County Schools. South side of Inscription Rock, El Morro National Monument. Photo by Timothy H. O'Sullivan, 1873. ^ CoreCivic. "CoreCivic: Better the Public Good". cca.com. Retrieved April 1, 2018. ^ "Cibola County Correctional Center". Corrections Corporation of America. Retrieved August 26, 2016. ^ "Western New Mexico Correctional Facility". New Mexico Corrections Department. Retrieved August 26, 2016. ^ Bixby, Scott; Betsy Woodruff (November 26, 2018). "Trans Woman Was Beaten in ICE Custody Before Death, Autopsy Finds". The Daily Beast. The Daily Beast Company. Retrieved November 27, 2018. ^ admin. "Justice for Roxsana: Announcing Legal Action To Hold Government Accountable for Transgender Asylum-Seeker's Death". TransGender Law Center. Retrieved November 27, 2018. Baldwin, J.A. and D.R. Rankin. (1995). Hydrogeology of Cibola County, New Mexico [Water-Resources Investigations Report 94-4178]. Albuquerque: U.S. Department of the Interior, U.S. Geological Survey. Maxwell, C.H. (1989). Mineral resources of the Petaca Pinta wilderness study area, Cibola County, New Mexico [U.S. Geological Survey Bulletin 1734-H]. Denver: U.S. Department of the Interior, U.S. Geological Survey. This page was last edited on 5 April 2019, at 17:33 (UTC).